A Mexican family moves to South Africa and opens a restaurant named after their home town. They grind their own corn to make fresh tortillas and use Abuelo’s (grandfather’s) margerita mix recipe. Sounds perfectly idyllic, doesn’t it? Unfortunately most things at San Julian are not (except the margeritas). My first qualm about San Julian is the menu – not that it’s diffcult to understand (most things are lost in translation), but that everything seems so… the same! Each dish is made with tortillas, whether they are quesadillas, tacos or flautas. No where was there menudo (Spanish soup), tamales or chile. At a table of four girls, there were only two dishes chosen and sadly, I was the definite loser! My Flautas en Salsa Verde was presented to me and I sighed. 3 cigar-sized tubes made of, you guessed it, tortilla, stuffed with non-descript chicked and served with a tiny mound of Spanish rice. The Spanish rice was superb, but my quarter cup portion barely touched sides. The cigars also disappeared very quickly, leaving my tummy rumbling, but at the price, unable to order anything more. No one said anything, but the other dish chosen by my dining partners did not look particularly apetizing either. Diced meat on dry tortilla discs certainly doesn’t appeal to me. The service is charming and the music delightful, but the best part of the evening must have been the margeritas. Salty-sweet goodness doesn’t come better than at San Julian. My advice: go for drinks, don’t have too many (your bank balance will cry), soak up the atmoshere, but eat before you go. San Julian, Green Point, 3-4 State House, Rose Street, 021 419 4233, Mains +-R70 (half portions available), Margeritas: R40, Service: friendly and accommodating. When most South Africans think Mexican food, visions of greasy, cheesy nachos and oil dripping chilli poppers come to mind. Thank goodness, this no longer need be the case with El Burro in town. A quiet, windless Cape Town evening (impossible, I know!) gave rise to my house mate and I feeling the need to have one last gorgeous week night dinner out before the real work of the year began. I had heard good things about El Burro and seeing as it is only a R14 cab ride from our house, we headed out. We were lucky enough to get a teeny tiny table to for two on the balcony (so book before if this is where you want to sit!). We really felt like we were at a little Mexican cantina, sitting on a precarious mini-table on the side of the road, but our friendly waitress and beautiful view made up for having to squeeze our food onto the table. The view of the Green Point Stadium and the newly “greened” area around it made for a particularly good Cape Town feel. The decor of El Burro is classic Mexican bits and bobs, without looking kitsch or too trendy. My favourite touch is a “wall” of hanging baskets, wooden hearts and fairy lights that encloses one side of the balcony. So pretty! The menu which lay before me sparkled with Spanish words which I had to ask the waitress about – she was clearly new and said they were “just fancy words”! The menu has no plain cheese nachos – a sign that this is the real deal (like Italian restaurants that don’t serve pizza!). Enchiladas, soft tacos, salads all with a choice of meat fillings, or fish, or grilled vegetables, made choosing a meal exceptionally difficult. I finally decided on a chicken enchilada and my house mate, staying with chicken (though there are so many options), settled on a chicken soft taco. The food was quick to arrive and delicious – everything I could have wanted. My enchilada had two tortillas stuffed with chicken, drenched in a tomato/chilli sauce and lots of sour cream – my real weakness! I could only eat one, but what an excellent next day lunch the second one made. 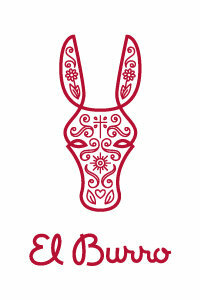 And this is what struck me about El Burro – the quality and quantity of food comes at a very decent price. My house mate’s soft tacos were also a hit. A soft taco is what most people call a wrap – all the ingredients come on the side and you are given two tortillas to fill to your heart’s desire. Not enough sauce on your taco or enchilada? El Burro gives each table six little bowls of magic to add a little personal flair to your meal – salsa, chilli, donkey’s revenge (really, really hot chilli!) and sour cream, just to name a few. All in all my meal was superb and I will definitely be visiting El Burro again. We might have decided another glass of wine was in order to really celebrate the beautiful Cape Town night which lead us to the Slug and Lettuce down the road, but that is another story entirely! A lacuna is a gap in knowledge, an open space, in history and literary theory. Barbara Kingsolver takes advantage of this definition by leaving much for the reader to figure out in this exquisite book about love, politics, fear and loss. Harrison Shepherd is a shy young boy, dragged to Mexico from his home in the United States by his Mexican flapper mother (this is the 1920 after all). She flits from man to man, following the money she so desperately needs. Harrison needs to adapt to his new surroundings and language, but he never quite finds a place to fit in – except when swimming in the sea. Harrison is again moved to Mexico City and, forced to find an income, fate leads him to Diego Rivera as he is painting his mural in the National Palace. From being a plaster mixer, Harrison finds his life irretrievably united with that of Rivera, his wife Frida Kahlo and exiled Communist figure, Leon Trotsky. This epic novel stands out as it is not Harrison Shepherd himself who is a revolutionary, a dreamer or martyr, but his life is so interwoven with the politics of his time that he is swept up and cannot lead the simple life he craves. From revolutionary Mexico in the 1920s to the Red fearing USA post-World War 2, The Lacuna involves a side of history which is ugly and often left undiscussed . This is not only America’s hypocrisy and fear of Communism and all it entails, but also the profound misunderstanding and misinformation that lies at the heart of this fear. 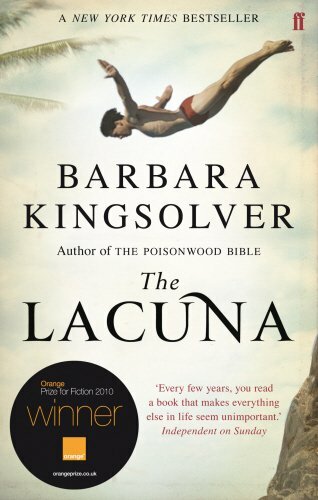 Kingsolver writes The Lacuna through two narrative voices – Harrison Shepherd through his journals and letters and Violet Brown, his assistant who has compiled all his writings. With these dual voices, Kingsolver creates a rounded image of a man who does not understand the importance of his place in history and his deep discomfort with himself. Violet Brown’s voice is strong, believable and sure, whereas Harrison Shepherd’s voice is unsure, nervous and vulnerable. At times the voice created for Shepherd feels too old for his character, too affected, but that is part of his discomfort with himself. Frida Kahlo is portrayed as a fiery woman, much like she is by Salma Hayek in the film Frida. Her connection with Harrison is special is it is only with him she shares her weaknesses and Harrison his. The relationship between them is integral to the novel and she provides much of the drama. I loved reading The Lacuna and, at 670 pages, it was easy to read and left me wanting to find out more about this time in US and Mexican History. This is Kingsolver’s best work – it does not have the sentimental ending of The Poisonwood Bible and it is no wonder she has taken so long to write it. One has to wonder whether she had similar arguments with publishers about the title as Harrison Shepherd does in the novel. P.S. This is a work of fiction – Harrison Shepherd, as much as it pains me write it, did not exist, but I hope you all know that Rivera, Kahlo and Trotsky were definitely real people!